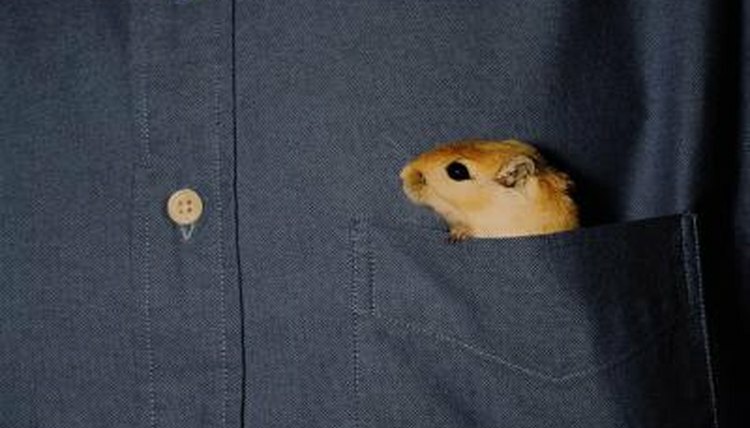 If you are lucky enough to have a wee gerbil in your life, a proper and comfortable housing environment for him is a major priority. This doesn't just involve the cage, but all of the important things that should be inside of it, too. Since gerbils are burrowing rodents, bedding is a big consideration. Gerbils are companionable critters and tend to flourish when they live in small groups of their own species. Since gerbils naturally spend a lot of time burrowing and constructing nests, it's crucial to provide them with the right "tools" in which to do so. Out in the wild, gerbils do a lot of elaborate digging, establishing many safe havens that they use for stashing away valuable sustenance, avoiding dangerous predators, rearing offspring and simply resting. Some examples of suitable and safe bedding for gerbils are aspen shavings, timothy hay and corncob. Some gerbils might experience allergies around aspen shavings, however, so if you notice anything of the sort, change the bedding out immediately. White paper towels that are cut up into small scraps also can work, but can sometimes capture unpleasant odors more quickly. Put a minimum of 3 inches of the appropriate material of your choice into your pet's cage. That way he can comfortably dig all he wants. Numerous types of bedding are unsuitable and unsafe for gerbils. Cedar and pine shavings both give off strong smells that can be hazardous to gerbils. Newspaper is a severe bedding no-no too. The ink emitted by newspapers can be poisonous. Cotton wool also is unacceptable. If your gerbil, for whatever reason, swallows any of the stuff, it could lead to major -- and extremely harmful -- obstructions within his body. If you ever have any safety concerns regarding bedding, consult a veterinarian. Don't use any bedding unless you're 100 percent sure it's safe for your pet. Not only is it important to select the right kind of bedding, it also is important to always keep it clean and fresh for your tiny rodent. Go out of your way to switch out the bedding once a week or so. If your gerbil's bedding is dirty and is full of lingering ammonia odors, it could bring upon breathing issues -- not good at all. Diligently extract any remnants of stool matter in the bedding every day, as well.